Taco Tuesday?! Or…tacos every day!! Yes, please! These are guilt free, tasty, FULL of healthy goodness, vegan, all natural… need I go on? I also find it hilarious that the “meat” on this taco actually LOOKS like taco meat. Yet another added bonus. I found the original recipe on Oh She Glows, and basically used the same recipe, but different lentils, and I added a few things. Feel free to add onions – I only use green onions, but you can add onions into the peppers/garlic mix too. Also, the cashew cream is in place of sour cream, and is REALLY good. You can use it a lot of other ways as well, so make it! I used Oh She Glow’s exact recipe, and the link is below as well as the recipe. This is one meatless recipe where you won’t miss the meat!! Delish! Heat a pan over medium heat and add in 1-2 tbs of oil. Add the garlic in. When it becomes translucent, then add the peppers and mushrooms. Cook the garlic and peppers over medium heat for about 15-20 minutes, reducing heat if necessary and stirring frequently, until cooked through. Prepare the taco meat: Add 1 3/4 cups cooked lentils (you’ll have some leftover) and all the toasted walnuts into a food processor and pulse until chopped (make sure to leave texture). Stir or pulse in the oregano, cumin, chili powder, and salt. Stir in the oil and the water until combined. 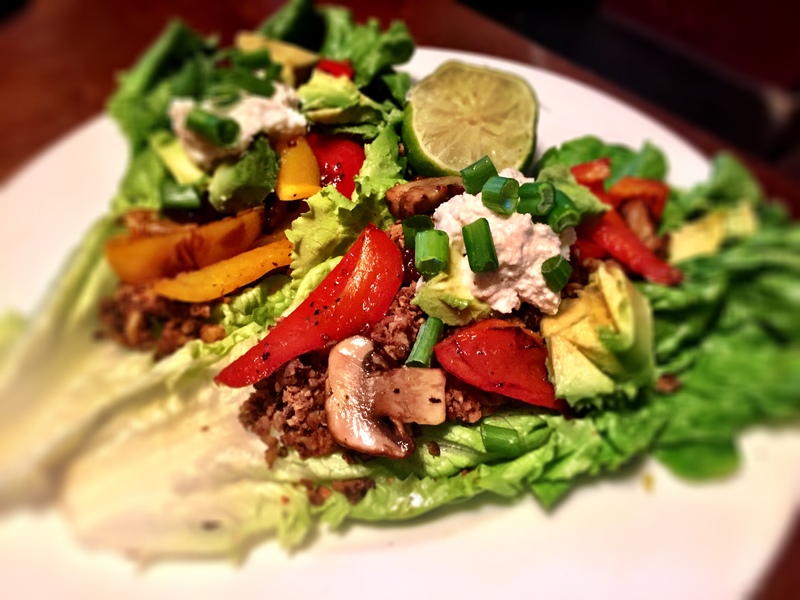 Assemble: Add a large lettuce leaf onto a plate, top with taco meat, sauteed peppers + mushrooms, and the rest of your desired toppings. Once it’s super smooth, it’s ready! Transfer into a small container. The cream will thicken up as it sits. Sounds AMAZING – I would LOVE to!!! Such a great idea!!! Just let me know when! Just let me know how I can help and what to do!! Can’t wait! Thank you!! Soooo good! Your blog is beautiful – just started following! Aww thanks Megan ❤ it means a lot!! Thank you!! If you try it – let me know what you think! Yum! I’ve made this before too, love it! Awesome!! So good and so fresh – I just love it! !